Wincor Nixdorf NABUCCO (--.2016) - Paper planes - new imprint. Mint ATM, franking complement (EC 0,01 EUR COMPLEMENT AFFRANCHISSEMENT ECOPLI). Wincor Nixdorf NABUCCO (--.2016) - Paper planes - new imprint. Eight mint ATMs, different franking complements (8 x 0,01 EUR COMPLEMENT AFFRANCHISSEMENT). Wincor Nixdorf NABUCCO (--.2016) - Paper planes - new imprint. Cover mailed to Spain (IP 1,00 EUR LETTRE PRIO INTER). Wincor Nixdorf NABUCCO (--.2016) - Paper planes - new imprint. 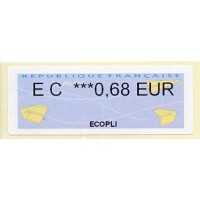 Mint set 6 values (EC 0,68 ECOPLI - LV 0,70 LETTRE VERTE - LP 0,80 LETTRE PRIORITAIRE - IP 1,00 LETTRE PRIO INTER - IP 1,25 LETTRE PRIO INTER - LV 1,10 LETTRE SUIVIE).